With a renowned history for building commercial and military vessels, as well as superyachts, RMK Marine will draw on its extensive technical and construction capabilities in building the 55m XXL. Ozgur Numan, RMK Marine’s Yacht Division Director, commented on the project: ‘The 55m XXL is an exceptional superyacht with design that emphasizes all the great attributes of a contemporary explorer yacht. The robust lines are complemented by an efficient and highly seaworthy hull design, as well as vast interior and exterior spaces. This combination results in an extremely elegant explorer superyacht able to take the owners wherever they dream to cruise.” Hot Lab and RMK have collaborated on award-winning superyachts in the past, so were a natural fit when conceiving the project. Enrico Lumini, a founding partner of Hot Lab Design, commented, ‘The layout on bord gives guests a feeling of being on a 70 m superyacht rather than one of 55m. This is notable in the wide decks and incredible availability of exterior space for living and dining areas, as well as the roomy beam of 12.2 m and full-height windows found throughout. In total, the 55m XXL incorporates more than 700 sqm of guest areas including over 300 sqm of exterior space.’ The XXL will be capable of conveying twelve passengers, with a crew of up to 16. The large fuel capacity and efficiency will provide a range of 6,000nm at a cruising speed of 12-knots. Naval architecture on the project was provided in-house by RMK Marine, and it has been specified with twin MTU 16V 2000 M93 engines, though this could be adapted based on the owner’s preferences. Building work on the vessel is already well underway, with completed steel hull construction and developed engineering. 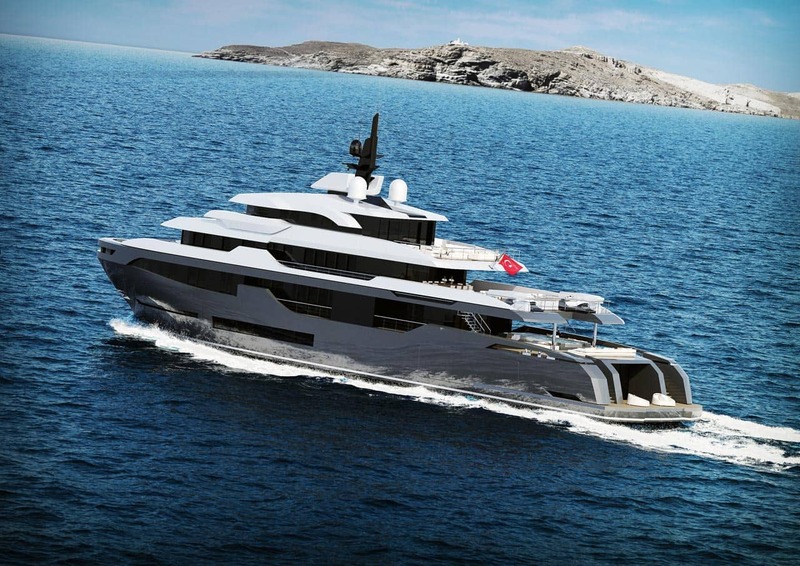 This reduced lead time means the project represents a highly attractive opportunity for a buyer who wants all the advantages of an explorer superyacht with custom interior and superstructure, but with a delivery time that is significantly shorter due to the construction work already carried out. Hot Lab Design has created a general arrangement for the interior that is perfectly suited to longrange cruising with private areas and panoramic views both inside and out. There remains a great deal of flexibility in this general arrangement, including transforming the guest accommodation from four to six cabins. The original designs for the yacht’s four-deck layout include a sleek and spacious sky lounge that opens out onto a sun deck with ample seating space for guests to enjoy the cruising environment. An elevator serves all decks, making the yacht easily accessible for those who are less mobile. The owner’s cabin is located on the upper deck forward, with panoramic views over the yacht’s bow and sides, double walk-in closets and his and hers bathrooms. To the aft, a large saloon provides a comfortable space in which to relax and enjoy a movie on the on-board cinema system with 2.5 m screen. The aft deck offers al fresco dining as well as a further lounging area and a bar with spectacular views to the aft of the yacht, flanked by on-deck storage for two jet skis. These can be tailored to the owner’s particular wishes for tenders and toys to be carried on board. The main deck features two VIP cabins towards the bow of the vessel, a cigar room/library, dining area and main saloon with large U-shaped seating and a further home cinema space, which opens out onto the main deck aft with an 18 sqm pool. The lower deck’s suggested layout features two VIP cabins and a twin cabin with Pullman bed for additional guest accommodation, and a spa with massage area and steam room. A tender hatch to the starboard aft area opens up the central space to an ever-popular beach club space, with access to the water for tender rides and water sports. As a special additional feature of the 55m XXL design, the piéce de resistance, is its private cinema room on the lower deck. ‘We are very excited about this new 55m XXL model from RMK Marine and Hot Lab Design. With such a reduced delivery time, outstanding considerations of living space and robustly-built platform, the 55m XXL is sure to be a success,’ concluded Numan.